From TRD New York: Compass tapped a former Facebook and Amazon executive as its new chief people officer — counting on him to replicate the massive recruitment and expansion he oversaw at two of the world’s most powerful tech companies. Madan Nagaldinne will assume the newly-created post on Sept. 1, reporting to CEO Robert Reffkin and COO Maëlle Gavet, the firm said. As a member of Compass’ executive team, Nagaldinne will be responsible for human resources strategy, including recruiting, compensation, benefits, performance management and education as the brokerage expands domestically and into international markets. A graduate of the London School of Economics, Nagaldinne worked as a software engineer before moving into HR. Most recently, he worked at Outcome Health, a $5 billion health care technology company. Before that, he worked at Facebook as head of HR for the social network’s global sales team, New York office and Asia Pacific region. He also managed a 100-person HR team at Amazon, where he helped staff up the e-commerce giant as it expanded into Asia. 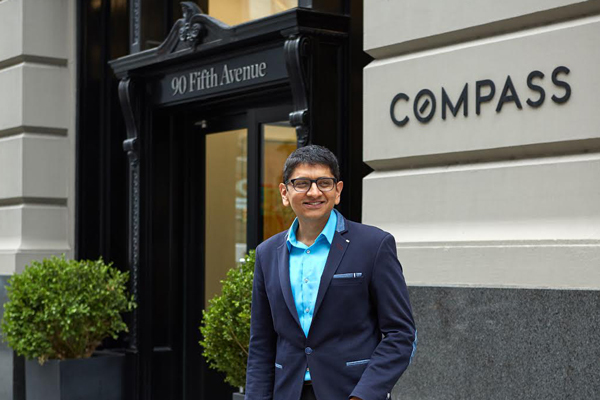 Nagaldinne is the latest addition to a growing C-suite at Compass. The firm, which has raised over $225 million from investors to date and is valued at over $1 billion, had been looking to hire an executive for the chief people officer role for nearly a year. Portions of that job were handled by Ciara Lakhani, who had been with Compass since 2014 and served as head of people and culture. As the company grew, however, it sought an executive with more experience, sources said. Lakhani, who was involved in the search, has taken a job as the vice president of people at Dashlane, a New York-based password manager that’s raised $52.5 million from investors. She did not respond to a request for comment. In addition to Gavet, who came to Compass in January after a stint at Priceline Group, Compass hired Julie Binder as head of communications and Pooneet Kant, a former Uber exec, as director of strategy and business development. Amy Middleton joined as director of marketing from Sotheby’s International, and Jenifer Vandagriff was hired as the head of user experience, which involves coming up with new products for agents. With around 1,600 agents nationwide, Compass has doubled its headcount over the last 12 months, and has about 100 open jobs across its 30 offices. In June, Reffkin told The Real Deal the firm would have an international presence within 18 months. Compass says it’s profitable in several markets, with gross revenue of $180 million in 2016. But as TRD reported last month, questions still persist over how Compass will deliver returns to early backers who enabled its rapid expansion in a fractured industry. Some industry insiders also believe Compass will have to continue to raise equity to fuel its growth, and it’s unclear if it would stick with private investors or take the plunge and go public.